Has your friend, colleague, acquaintance, or barista “invited you to connect”? Is his or her invitation still “waiting for your response”? Do you receive bi- or triweekly emails reminding you of these facts. If so, you’re probably one of the 175 million members of LinkedIn, the résumé-reliant professional-networking site. Chances are you spend a fraction of the time on LinkedIn that you do on your other social networks. The average Facebook user clocks about six and a half hours on the site per month; for LinkedIn, it’s 17 minutes. So why on earth is the website doing so stunningly? 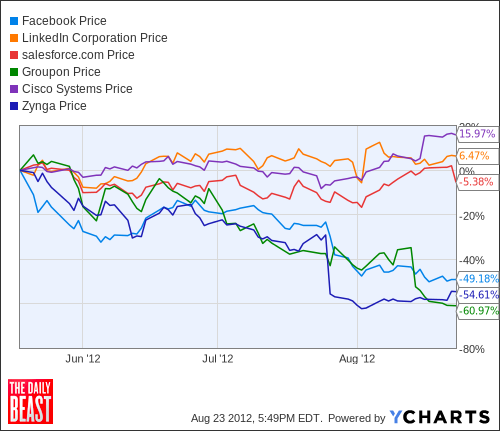 As other social-media companies suffer—a botched Facebook IPO, millions lost at Zynga, and repeated face-plants at Groupon—LinkedIn is riding high. In the most recent quarter, revenue was up more than 89 percent from the year before. While the market hammers Facebook stock, investors can’t get enough of LinkedIn: its shares are trading at an astronomical 751 times earnings. According to Forbes, for every hour a Facebook user spends on the site, Team Zuck makes 6.2 cents. LinkedIn makes 20 times that: $1.30 per user per hour. Time is money, we’re told. But time on LinkedIn seems to be worth a lot more than time on Facebook or other social-media sites. To that average user, the site is better known for its spam than its services. But LinkedIn’s laurels, not to mention its main revenue streams, aren’t based on users like you and me. They’re based on businesses. LinkedIn is riding high as an enterprise network, used by larger institutional clients—headhunters, human-resources departments—to browse and scout talent. And its success is part of a broader trend: the online triumph of business-to-business (B2B) commerce over business-to-consumer (B2C) marketing. It’s tough to make money off Web media. There’s the subscription gambit: get people to pay a little more for fancier features and more access. That’s a strategy now being adopted by scores of beleaguered publishers, newspapers, and magazines, tired of giving away their content for free. Results have been mixed. For every hour a Facebook user spends on the site, Team Zuck makes 6.2 cents. LinkedIn makes 20 times that. There’s the advertising model, social media’s classic money-making tactic. Give away the content for free, and let the advertisers pay for the eyeballs. Ads account for more than 86 percent of Google’s revenue and 84 percent of Facebook’s. Basing an online business on marketing puts your earnings on a very unstable foundation. Traffic can be fickle, as MySpace’s owners have found to their chagrin. Now, for business-to-business social media, that’s not a problem. Yes, LinkedIn has a premium model, in which it charges users for more bells and whistles. And it sells advertisements. But LinkedIn’s success centers on its “hiring solutions” business, which helps corporate recruiters find job candidates. Revenue from those clients accounts for 53 percent of LinkedIn’s business—and, more important, has more than doubled since last year. More than two thirds of the Fortune 100 are LinkedIn hiring-solutions customers. To illustrate, I’ve graphed percent change in the price of three online B2B stocks—LinkedIn, Salesforce, and Cisco—against three online B2C stocks—Facebook, Groupon, and Zynga. LinkedIn’s enterprise-oriented success is a bellwether for a reversal of fortunes in the Web sector. Consumer-facing networks are crashing, while B2B is booming. Only 32 percent of LinkedIn’s total revenue coming from advertising. Moreover, by targeting the professional audience—buyers of enterprise products, not Brazilian waxing products—its “marketing solutions” department can bring in more dough than traditional online advertisers. LinkedIn also uses the traditional “premium subscriptions” strategy, but doesn’t depend on it. Account upgrades, which streamline the otherwise-clunky interface, bring in 19 percent of the company’s revenue. The shift shouldn’t strike us as a surprise. In fact, it mirrors the first iteration of the Web, way back in the tech-bubble years. The consumer-facing marketers were all the first to go: Pets.com, Webvan, and Geocities all failed spectacularly. And who survived the tech bubble? Companies that had the capacity to generate revenue from other businesses: GoDaddy.com, Expedia.com, and obvious LinkedIn-spiration job site Monster.com. LinkedIn recently renewed a big hiring-solutions deal with Microsoft, which will officially package the network’s résumé and enterprise data into its Office products. That’s a B2B deal that automatically gets LinkedIn onto millions more computers, whether users sign up or not. As Facebook, Groupon, and now Twitter try desperately to turn user information into targeted ads, LinkedIn is doubling its sales staff and spending a third of its revenue on marketing to other companies. The beleaguered journalism industry (cough) has seen the same bifurcation. Outlets that provide value-added info for businesses, whether through wires, data streams, or granular financial reporting—Bloomberg, The Wall Street Journal, Financial Times—have been able to charge users for the information. By and large, general-interest news websites have not. What does that mean for our experience of the Web? For one, it changes how truly “social” our online media can be. Facebook’s a place you go to find people you know. LinkedIn is a place you go to find people you don’t know. For many, the spirit of the open Web was personal sharing: pictures of friends, funny videos, witty tweets. Now, as Wall Street Cassandras warn of another popping“social” bubble, market forces may be pushing companies like Facebook away from, well, faces. The real money is streaming in from faceless businesses and enterprise clients, eager for e-commerce. And though LinkedIn may fill your inbox with spam, it just might get you hired, too.